Peter “PAD” David’s Spyboy appeared from 1999 to 2004, in a mix of anthologies and own-title miniseries. It was a fast-paced, goofy mix of animé influences, pop action-espionage tropes, and fast-paced young adult fiction of that time. Known Relatives: Sean Moore (father), Anita Little (mother, believed dead), George Moore (grandfather), Madam Imadam (aunt), Julia Little (Gila, aunt). Group Affiliation: Agent of S.H.I.R.T.S..
Spyboy is a highly trained intelligence operative. He’s skilled with most weapons and in unarmed combat. The Spyboy persona was implanted in Alex at a young age. It is normally activated by a certain combination of flashed lights, so his activation and deactivation is generally at the discretion of others. Bombshell has a trigger device, but so do a number of Spyboy’s enemies. 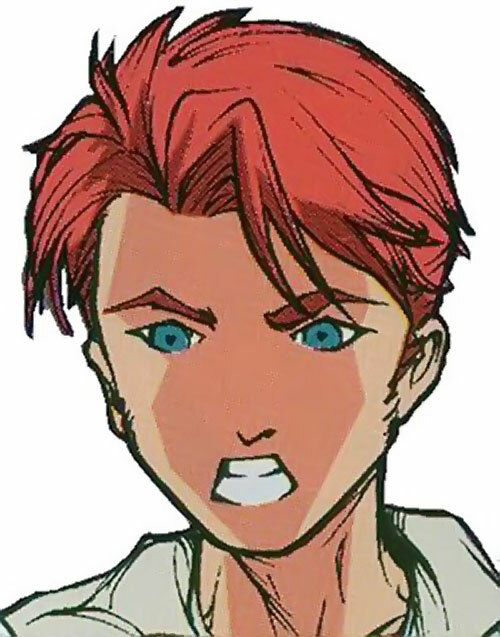 However, Spyboy has triggered the change himself when Alex has been under extreme stress. Alex has no access to any of Spyboy’s skills. He’s a fairly normal teenager. Alex grew up believing himself normal, his mother having died when he was young. He moved around a lot with his father and grandfather. His father had always taught him to keep his head down and not attract attention. As a result he often became a target of bullies. After yet another encounter with school bully and drug pusher Schweitzer, and his flunkies Derrick and Butch, the Spyboy persona was activated by an agent of Gila. He followed Schweitzer and the others to a meeting with their supplier, which he broke up, coming into conflict with the Gourmet. He was joined by the spy Bombshell. She had been watching him for poorly funded S.H.I.R.T.S. (Secret Headquarters, International Reconnaissance, Tactics and Spies). They freed Butch, who soon adopted Alex as his new best friend. Then they escaped the Gourmet, whom Spyboy left to be eaten by the garbage disposal. Alex learned that his family had been spies. After his mother’s death, his father had retreated into grief. Then Alex had become a test subject for an experimental project, where he was imprinted with the Spyboy persona. The project was secretly run by Gila’s organization, S.K.I.N.S. (Supreme Killing INStitute). His grandfather, George, rescued him from this. After George dragged his father from his grief, the three of them going on the run. They kept below the notice of all spy agencies for well over a decade. With his presence now known by a number of agencies, legal and criminal, Alex and his father were inducted back into SHIRTS. 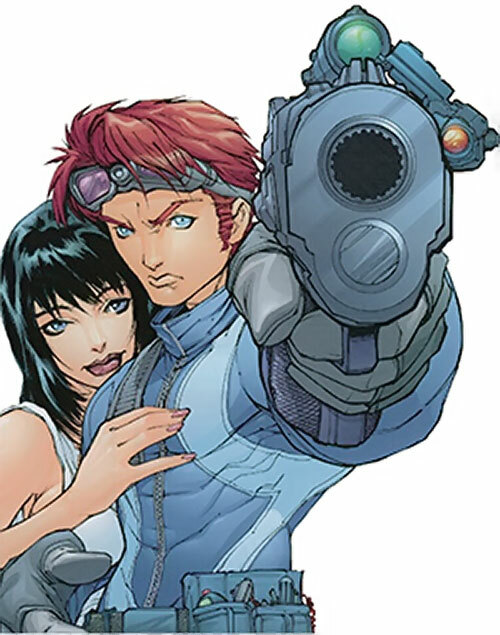 Spyboy was partnered with Bombshell, who joined Alex in school under the alias Marta Hari. A mission for S.H.I.R.T.S. took him to Marispan. There Madam Imadam, head of the Palindrome, revealed she was his mother’s sister. He also encountered Gila, Madam Imadam’s sister, who didn’t deny she was his mother. Bombshell was captured during this mission. Alex followed the slavers who’d taken her to Hindasti, where he rescued her from Slackjaw. Escaping to Japan, where they were met by Spygirl, they again had to deal with Slackjaw. He had followed them and teamed up with criminal mastermind Annie Mae. She’d supplied him with a giant robot with which he was demolishing Tōkyō. But Spyboy & Co. had to use another of Annie Mae’s giant robots to stop him. Finally returning home, Alex learned that the agent who’d impersonated him had accidentally managed to get him nominated for class president. He won the election, beating Schweitzer. S.H.I.R.T.S. then appeared to have been infiltrated by members of Young Justice. Spyboy and Co. came into conflict with them. Meanwhile, YJ investigated reports that Spyboy and Co. had infiltrated the A.P.E.S. (All-Purpose Enforcement Squad) agency, with whom YJ were associated. Working together they learned that the infiltrators were Super-Deformeds, mini versions of them. These had been created by a team up between Annie Mae and Harm. They managed to prevent the Super-Deformeds attempt to open a Hell-Hole under Tōkyō. Coming into conflict with Spyguy on a mission, Alex proved unable to recognise him when he turned up as a substitute teacher, Guy McGuffin. He thus fell afoul of him when he managed to have Alex implicated as a terrorist. Forced to abandon the life he knew, Alex was saved from Spyguy by his kind-of girlfriend, Lori. She revealed herself to be a spy (possibly an agent of Gila). Lori offered him a new home, claiming she could take him to his mother, who was still alive. His mother was still alive. She was disguised as Butch’s mother, Rita Moody, who had died in an accident a while before. Anita had taken her place to spy on Alex. Sean had deduced her deception just before they caught up to Alex. But he didn’t have a chance to reveal this to him as they tried to convince him not to leave with Lori. The final scene has Alex deciding which option to choose. The Spyboy persona is ruthlessly devoted to completing its current mission? He gives little concern to the lives of his (or Alex’s) friends. He tends to be short with people, unless actually assuming a role as part of the mission. 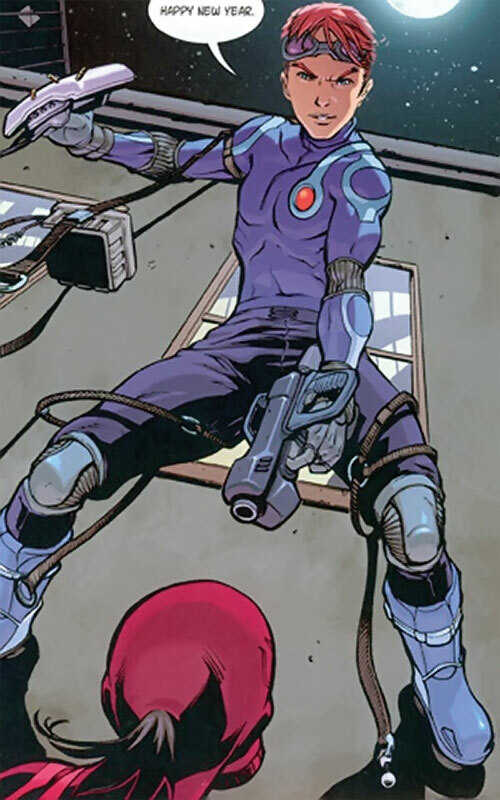 Alex was initially overwhelmed by the revelation of his family’s history, and of the Spyboy persona. But he has come to accept it and want an increasing role in the espionage stuff. His desire to be more involved is partly him wanting to do the right thing, and partly a need to prove himself. He seems slightly jealous of the Spyboy persona’s competence. Since being activated, the Spyboy persona is always aware. But while Alex is in control, Spyboy is stuck in his subconscious trying to get Alex to listen to its advice. Occasionally this filters through as Alex’s instincts. 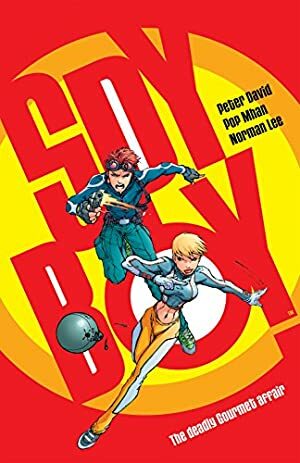 Spyboy has already crossed over into the DC Universe. And there’s little contradictory stuff in it to prevent it being fully integrated into its own little corner of the DC Universe. S.H.I.R.T.S. could fit into the, already fairly crowded, American intelligence community, its low budget helping it remain relatively anonymous. Headquarters (Confined), Iron Nerves, Languages (Japanese), Lightning Reflexes, Rich Friends (S.H.I.R.T.S. ), Schtick (Goonbane). Bombshell (High), Spygirl (High), S.H.I.R.T.S. (High). Alter Ego (Uncontrollable), SIA (The mission), Secret ID. COSTUME [BODY 05, Cling: 04, Energy Absorption (Electricity Only): 05]. His suit is insulated against electrical attacks, and his boots allow him to walk on walls. Goggles [BODY 04, Accuracy (Magnum Opus): 09, Interface (Spy Cycle): 07, Radio Communications (Scrambled): 12, Thermal Vision: 04, Ultra Vision: 04]. 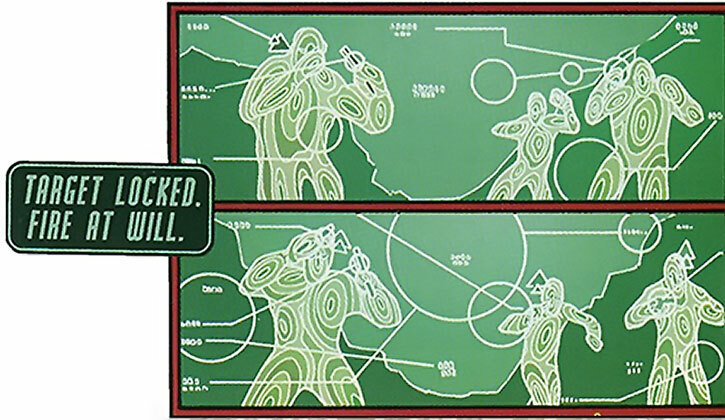 The goggles are linked to his Spy Cycle and Magnum Opus gun, providing a targeting system for his gun, and allowing him to remote control the Cycle. Spy Cycle [BODY 07, EV 06, Fog: 05, Projectile Weapons: 05, Running: 07, Swimming (surface only): 06, Misc. Advantage (Windshield can be used for Blocking)]. 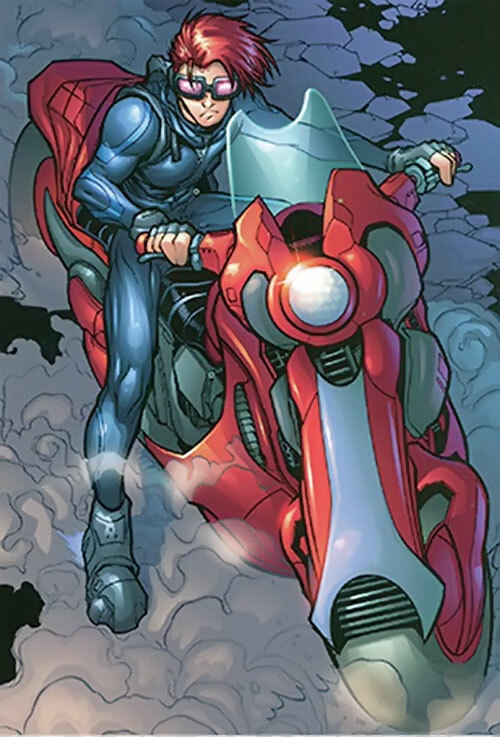 The Cycle can alter its shape to allow it to move on water, it can emit a smoke screen covering the surrounding area, is has a machine gun (Projectile Weapons) and rocket launcher (EV) set into it, and the materials used are strong enough that its windshield is bulletproof. ODDBall [BODY 04, Chameleon: 06, Invisibility: 06]. A ball-like optical distortion device which can disguise the user’s appearance, or make them, and up to a car-sized vehicle they’re within, completely invisible. Headquarters (Confined), Rich Friends (S.H.I.R.T.S.). Bombshell (High), Spygirl (High), SHIRTS (High). In the Spyboy Genre, combat is usually lethal. Many characters are so unused to holding back to perform non-lethal attacks that they can’t do so at peak efficiency. When trying to cause Bashing rather than Killing Damage, named characters cannot spend HPs on AV or EV. Helper(s): Sébastien Andrivet, Frank Murdock. Writeup completed on the 23rd of December, 2009.